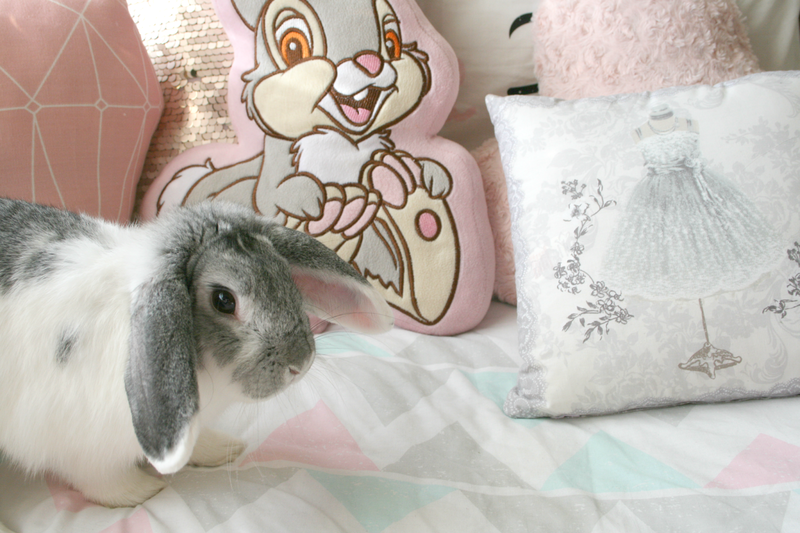 Aurora has been living with us now for almost 6 months now...so basically half a year and in that time I've realised some things that change when you live with a house bunny! If you've been reading my blog for awhile you'll know that after two weeks of having Aurora she got into an accident and broke her teeth and pulled them forward. Her operation is on the 15th of March, hopefully this one doesn't get postponed again! Basically she has to get all her front teeth out as they grow way too fast and because of her accident they stick out meaning her mouth is always open. I did do a post all about it here which included photos if you'd like to find out more, find it here! Both animals (Sheldon and Aurora) live upstairs with us and so upstairs is always full of bedding and grass and I'm going to blame Aurora for this because she has the free run where as Sheldon is in his cage most of the time. Then because we're walking on it upstairs means we drag it downstairs. By now we're well used to it and yes we hoover everyday but sometimes you just want a lazy day and ignore the bedding thats pretty much all over the house. Again though I'm putting all the blame on Aurora. I'm going to have to teach her how to use the hoover. Aurora is quite good in the sense that we never had to litter train her, she just knew if she had to pee to jump onto her blanket or into her bed to do so. However she is fed out of her cage which means she poops everywhere and anywhere she pleases. I know gross but when you've lived with small animals for so long it just becomes a normal thing. I've even woken up some mornings to find one in my bed..yes I know how glamorous! Fresh bed sheets? Lemme pee everywhere! So even though both animals belong to all of us, we say that Sheldon is mine as he was bought for me and I bought Aurora for my brother. So because our own animal lives with us even though we love them equally one is mine and the other is my brothers, but they both are ours. Does that make sense? Anyway my brother is 13 soon and he's in school so my parents buy Auroras food and I buy Sheldon's but we take turns so every second time we need food and bedding I'll get them and then my parents will, you get what I mean. Sheldon will get over a months worth out of his bag of nuts however Aurora gets 2-3 weeks, she just really likes eating! We have to buy grass every second week, nuts every 3rd-4th week and then bedding every month or so, depending on how many bags we bought previous. So yeah, having small animals is just as expensive as a dog. So if you're thinking of getting a small animal because you think it would be cheaper than a dog you're quite wrong, trust me! Aurora has an attitude, a major one at that! She'll bite you, run laps around you and pee on your bed to annoy you. However everything she seems to do just makes me laugh. As I'm typing this she's biting my foot because she doesn't like that I'm taking up some of her space. She jumps on top of Sheldon's cage to annoy him and she'll take any chance she can to eat all his food. Any wires that may be on the floor or any gaps that may lead to the back of furniture, you may say goodbye to everything. Anything that may be breakable on the floor also has to be moved, basically everything needs to be taken off the floor so that your animals toys can take over! Aurora does not like to be picked up therefore she attacks us while we're doing so. You wouldn't believe how many people have alarmingly asked my what happened to my hand or arm because of the scratches she leaves on them. She's scratched my arms, hands, legs, neck, chest honestly the list is endless and it god darn hurts! Then after she does it she acts as if butter wouldn't melt in her mouth, she's a little bit crazy really! Do your animals run your house? I have a house bunny and I googled why they pee on beds/settees where you sleep and apparently it's because they see you as theirs and so they're marking it as their territory because you sleep there and it smells like you. My bunny does the same if he's left alone in my bedroom, absolutely terror haha.